Halflings rise to a humble height of 3 feet. They prefer to walk barefoot, leading the bottoms of their feet to become roughly calloused. Tufts of thick, curly hair warm the tops of their broad, tanned feet. Rather than place their faith in empires or great causes, many halflings prefer to focus on the simpler and humbler virtues of their families and local communities. Halflings claim no cultural homeland and control no settlements larger than rural assemblies of free towns. Most often, they dwell at the knees of their human cousins in human cities, eking out livings as they can from the scraps of larger societies. Many halflings lead perfectly fulfilling lives in the shadow of their larger neighbors, while some prefer more nomadic lives, traveling the world and experiencing all it has to offer. 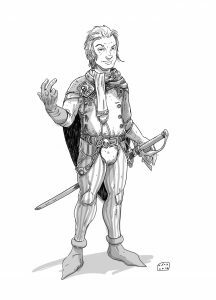 A typical halfling prides himself on his ability to go unnoticed by other races—a trait that allows many halflings to excel at thievery and trickery. Most halflings know full well the stereotypical view other races take of them as a result, and go out of their way to be forthcoming and friendly to the bigger races when they’re not trying to go unnoticed. They get along fairly well with gnomes, although most halflings regard these eccentric creatures with a hefty dose of caution. Halflings respect elves and dwarves, but these races often live in remote regions far from the comforts of civilization that halflings enjoy, thus limiting opportunities for interaction. By and large, only half-orcs are shunned by halflings, for their great size and violent natures are a bit too intimidating for most halflings to cope with. Halflings coexist well with humans as a general rule, but since some of the more aggressive human societies value halflings as slaves, they try not to grow too complacent. Halflings strongly value their freedom, especially the ability to travel in search of new experiences and the autonomy this requires. However, practical and flexible as always, enslaved halflings seldom fight back directly against their masters. When possible, they wait for the perfect opportunity and then simply slip away. Sometimes, if enslaved for long enough, halflings even come to adopt their owners as their new families. Though they still dream of escape and liberty, these halflings also make the best of their lives. Halflings are loyal to their friends and families, but since they dwell in a world dominated by races twice as large as themselves, they have come to grips with the fact that sometimes they need to scrape and scrounge for survival. Most halflings are neutral as a result. Though they usually make a show of respecting the laws and endorsing the prejudices of their communities, halflings place an even greater emphasis on the innate common sense of the individual. When a halfling disagrees with society at large, he will do what he thinks is best. Always practical, halflings frequently worship the deity most favored by their larger and more powerful neighbors. They also usually cover their bets, however. The goddess of both luck and travel seems a natural fit for most halflings and offering her a quick prayer every now and then is only common sense. Their inherent luck coupled with their insatiable wanderlust makes halflings ideal candidates for lives of adventure. Though perfectly willing to pocket any valuables they come across, halflings often care more for the new experiences adventuring brings them than for any material reward. Halflings tend to view money as a means of making their lives easier and more comfortable, not as an end in and of itself. Other such vagabonds often put up with this curious race in hopes that some of their mystical luck will rub off. Halflings see nothing wrong with encouraging this belief, not just in their traveling companions, but also in the larger world. Many try to use their reputation for luck to haggle for reduced fare when traveling by ship or caravan, or even for an overnight stay at an inn. They meet with mixed success, but there are just enough stories circulating about the good fortune that befalls people traveling with halflings to give even the most skeptical pause. Of course, some suspect that halflings deliberately spread these reports for just that reason. Age: A halfling reaches adulthood at the age of 20 and generally lives into the middle of his or her second century. Alignment: Most halflings are lawful good. As a rule, they are good-hearted and kind, hate to see others in pain, and have no tolerance for oppression. They are also very orderly and traditional, leaning heavily on the support of their community and the comfort of their old ways. Size: Halflings average about 3 feet tall and weigh about 40 pounds. Your size is Small. Languages: You can speak, read, and write Common and Halfling. The Halfling language isn’t secret, but halflings are loath to share it with others. They write very little, so they don’t have a rich body of literature. Their oral tradition, however, is very strong. Almost all halflings speak Common to converse with the people in whose lands they dwell or through which they are traveling. As a lightfoot halfling, you can easily hide from notice, even using other people as cover. You’re inclined to be affable and get along well with others. Lightfoots are more prone to wanderlust than other halflings, and often dwell alongside other races or take up a nomadic life. As a trickfinger halfling, you are clever even among your cousins, but you have a reputation (deserved or not) for being untrustworthy. Even so, you know that a little embellishment goes a long way toward improving any story and that sometimes lies are just better for everyone than the truth. Tricksy: You are proficient with the Deception skill and you add double the normal bonus whenever using this skill with Charisma. As a wiseheart halfling, you have a keen mind, being adept in both investigation and observation. You often find as much fulfillment in a musty old tome as most halflings find in a well-cooked meal. Intrinsic Learner: You are proficient in one of the following skills: Arcana, History, Nature, or Religion. You have an advantage on Intelligence checks for your chosen skill.